There are many reasons why some women cannot conceive, and one of the top causes is a blockage in the fallopian tubes, also known as tubal factor infertility, and is thought to be the cause of infertility in 40% of infertile women. Fallopian tubes are the delicate passages in a woman’s reproductive system where egg meets sperm. When an egg is released from one of the ovaries, it travels through one of the fallopian tubes, which are narrow ducts that connect the ovaries to the uterus. Fertilization takes place in one of the fallopian tubes, and the embryo then develops in the uterus. Any kind of blockage can prevent conception, as the egg cannot meet with the sperm for fertilization. A blockage can occur in one or both fallopian tubes that connect the ovaries to the uterus. Fallopian tubes can become blocked by adhesions (internal scars) that form when the body heals from an earlier surgery, infection, inflammation or trauma. Some common conditions or procedures that may cause blocked fallopian tubes are Endometriosis, Uterine Fibroids, Ectopic pregnancy, Genital Tuberculosis, Pelvic Inflammatory Disease (PID), Tubal Ligation Removal and Complications from lower abdominal surgery, such as a cesarean section. 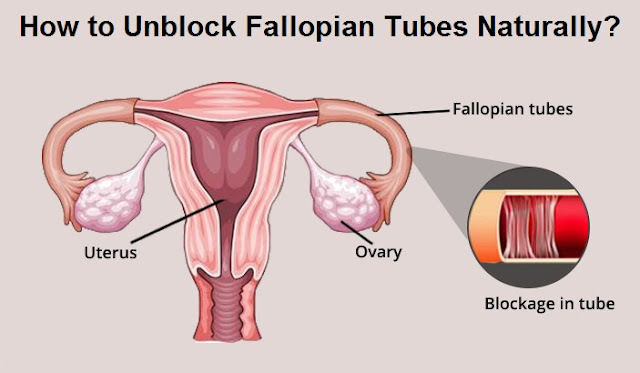 However, if the symptoms you are experiencing are indeed evidence for blocked fallopian tubes, then there are ways to unblock fallopian tubes naturally without surgery and you should consider them alongside or perhaps even before medical treatment. Going with the surgical procedure can hurt your fertility as it is not without risks and any loss in fertility may push you to choose IVF for getting pregnant in the future. IVF, however, is unfortunately out of reach for many couples. The Fallopian tubes are very small and this surgery is known to cause scar tissue. This could make the problem even worse. If that happens, your doctor will probably say that your only option for getting pregnant would be IVF (Invitro fertilization). Many women try natural treatments to unblock their fallopian tubes after the surgery which was supposed to open the blocked tube when they find that the tube is full of scar tissue again. While surgery is a common treatment for blocked fallopian tubes, there are natural options which can have great results without causing additional scar tissue to form. The following natural home remedies may treat blocked fallopian tubes without resorting to surgery or expensive flushing treatment. Make fine and smooth powder of seeds and ginger now add sufficient quantity honey to make a paste and then store in a glass jar. Take ½ tsp along with water in the morning on an empty stomach and at evening before dinner for 3-4 months. Make fine and smooth powder and store in a glass jar. Take ½ tsp along with lukewarm water in the morning half an hour after breakfast and ½ tsp half an hour before going to sleep. Soak fennel, carom, garlic and ginger overnight next morning simmer until reduced by 1 cup strain and stir well olive and nigella oils. Drink on an empty stomach daily for 40 days. Take one teaspoon English Mandrake seeds power along with warm water on an empty stomach for 3-4 months. Devlip’s Turnip seeds (Bryonia Lacinosa) has incredible results to treat blocked fallopian tubes. Pound coarsely all herbs and soak in water using a pot made of ceramic or glass for overnight. Do not use iron or aluminum pots because they may react chemically with the herbs. Next day Bring to a simmer and partially cover the pot with a lid. Let simmer until the liquid inside is reduced by half. Strain out the herbs now you have created a strong decoction for your syrup base. Return the liquid to the pan and add sugar. For gentle boil and simmering for up to an additional 30 minutes to thicken the syrup further. Let it cool and fill in bottle to store in the refrigerator. Take 1 tablespoon along with water in the morning and at evening for 2-3 months. Boil 2 cups of water in a small pot. In the meanwhile, wash the ingredients to rinse away any debris. Add the ingredients to the boiling water. Cover and simmer on medium-low heat for 15 minutes. Strain and drink 3 times in a week. Mix well Activated Charcoal and Flaxseeds powder with sufficient quantity of hot water until it forms a thick and smooth paste. Slather poppy seed oil affected area. Spread a thick coat of paste on a piece of gauze or cotton cloth. Place this on your pubic bone where your uterus lies and cover with plastic. Leave it for overnight next morning rinse it off with lukewarm water. Activated charcoal poultice has been used externally to effectively absorb wound secretions, bacteria, and toxins. A charcoal poultice can help in the treatment of infections and reduction in inflammation if you directly apply in over your uterus. Soak the flannel in castor oil until it is saturated. Place it over your lower abdomen, Place over the Fallopian tubes (one inch below the navel and about 3 inches on either side). Cover it with the plastic sheet and apply the hot water bottle. Cover with a towel, lay back and relax for 20-30 minutes. Remove the pack and massage the area for about one minute. After removing the pack, cleanse the area with a dilute solution of water and baking soda. Store the pack in a container in the fridge and reuse the same flannel up to 30 times. Apply these packs for several consecutive days each week or every other day for several weeks. How often you repeat the process is up to you and the time you have available. Within a few weeks, the castor oil packs should begin to increase circulation to your ovaries and uterus, helping to clear out congestion in the reproductive tract. Women who suffer from fallopian tube blockages and/or endometriosis may have to apply these fertility supporting packs to their abdomen for several months to experience their true benefits. Add ½ teaspoon Goldenseal root powder in a cup of water to simmer for 10 minutes. Strain and drink thrice a day. Goldenseal may help to protect the fallopian tubes from damage due to an infection. Also supports health of mucous membranes. It can also reduce the growth of foreign tissue and inflammation in the tubes. Add ½ teaspoon Dong Quai root powder in a cup of water to simmer for 10 minutes. Strain and drink thrice a day. Dong Quai reduce tissue congestion, eliminate muscle cramps, and improve circulation to the reproductive organs. It has both pain reducing and anti-inflammatory properties. Steep 2 teaspoons grated ginger root in a cup of hot water for 15 minutes strain add I teaspoon organic honey and drink twice a day. A wonderful herb used to increase circulation and promote blood flow to the reproductive organs. The increased circulation also helps to reduce inflammation of the uterus, ovaries or fallopian tubes. Pour 1 cup of boiling water over 1 tsp. of hawthorn flowers and leaves - or a mixture of the two. Steep the tea for 10 minutes and strain. Drink 1 cup of the tea every morning and evening over many months (the onset of its action is very gradual). Noticeable improvement in symptoms may take six to 12 weeks. The berries can also be used to make the tea. However, to be as effective as the flowers or leaves, prepare hawthorn tea by simmering 1 tablespoon of dried berries in 2 cups of water for 10 to 15 minutes. You can drink the tea up to three times a day. Peony root is usually taken in tea form. To make tea, Boil 3 cups of water in a small pot. Add 1 tablespoon coarsely powdered peony root to the boiling water. Cover and simmer on medium-low heat for 10 minutes, strain and drink. You can consume 3 cup peony tea a day to get the benefits for your body! Peony Root is known as women’s herb. It is best for women reproductive problems and regulates the female reproductive system. Peony Root is found to help in increasing the levels of progesterone in the female body. At the same time, it can balance estrogen and lower down the testosterone level. This means that it is perfect for you if your blockage is due to hormonal imbalance. Simmer 8 oz of water in a small pot over medium heat. Add the fresh or dried Echinacea. Cover and simmer for 15 minutes. Strain tea into a mug and drink Echinacea is really great herb which has been reported to cure a fallopian tube blockage effectively. The herb has additional properties such as antimicrobial and anti-inflammatory. The herb will help your body fight against the infections that cause blockage of the fallopian tubes. Once that is done, your tubes will clear out automatically. Use dried leaves to make a hot tea. Boil water and place bearberry leaves in a tea infuser then place the infuser inside a mug. Pour the hot water over the infuser and steep for 15 minutes. Drink this tea one times a day for 10-15 days. Bearberry has been shown to be effective for combating vaginitis, due to its antimicrobial activity. Uva Ursi aids the body in removal of excess fluids for proper daily detoxification. It helps reduce congestion and excess body fluids, thus clearing fallopian blocks due to fluid or blood collection.